India's record-breaking sequence of nine consecutive ODI triumphs was brought to an end today by Sri Lanka who salvaged some pride with a consolation 68-run win in the fifth and final one-day cricket match of the series which has already been clinched by the visitors. The defeat means that India could not make a clean sweep of the series and had to be content with a 4-1 victory margin. Indian skipper Mahendra Singh Dhoni today blamed lack of bowling resources for their defeat to Sri Lanka in the fifth and final cricket one-dayer, which halted their stupendous nine-match winning run here today. Harender Singh, the Indian coach in-charge, failed to read too much into Holland’s performance in the match against Germany yesterday in which the former pounded the latter 7-1 to storm into final of the Punjab Gold Cup Hockey Tournament. In the title clash tomorrow, Holland will clash with India, who defeated New Zealand 3-2 last night. Australia today snapped their five consecutive ODIs losing streak by registering a thrilling 32-run victory over New Zealand in the must-win third tie here and kept the five-match series alive. British media vented their full fury on England's ''spineless'' cricket team today following their humiliating defeat by West Indies in the first Test. England were skittled out for 51 in their second innings in Jamaica as they lost by an innings and 23 runs. It was their third-lowest score in a Test match. Chasing a daunting 678 for victory, South Zone squandered the fine start given by their openers Robin Uthappa (94) and M Vijay (63) to end the fourth and penultimate day of the Duleep Trohpy final against West Zone at a precarious 232 for three here today. India's record-breaking sequence of nine consecutive ODI triumphs was brought to an end today by Sri Lanka who salvaged some pride with a consolation 68-run win in the fifth and final one-day cricket match of the series which has already been clinched by the visitors. The defeat means that India could not make a clean sweep of the series and had to be content with a 4-1 victory margin. Sri Lankan opener Tillakaratne Dilshan missed a ton by just three runs and Kumar Sangakkara hit 84 while spin wizard Muttiah Muralitharan regained form just in time to avoid the series whitewash. Half centuries by Yuvraj Singh (73), debutant Ravindra Jadeja (60 not out) and skipper Mahendra Singh Dhoni (53) could not be enough as Indian top order failed to click and the visitors were rolled over with seven balls to spare in chase of Sri Lanka's challenging 320 for eight on a batting track. The Indians went into the final match without key players like Sachin Tendulkar, Zaheer Khan and spinner Pragyan Ojha with the team management deciding to try out bench strength. Yuvraj gave some stability to the run chase after his side was reduced to 85 for four inside the 15th over. India, however, struggled again after some time as they kept losing wickets at regular intervals on a day when nothing went right for them. A cautious Dhoni and Jadeja only tried to delay the inevitable by putting on 55 runs off 66 balls for the seventh wicket. Dhoni's effort included two massive sixes and a hit to the fence. He reached his 50 with a towering six. Jadeja's 77-ball knock was aided by four fours. India round off the tour with a one-off Twenty20 international on February 10 before returning home next day. The visitors got off to a shaky start with opener Virender Sehwag dismissed cheaply for six by Thilan Thushara on a poor shot after hitting the bowler for a four on the previous ball in the second over. He was immediately followed by Suresh Raina, who was done in by an impeccable field placing by Sri Lankan skipper Mahela Jayawardene in the third over and at that stage India were tottering at nine for two wickets in chase of a mammoth target. The other opener Gautam Gambhir, who made 150 in the previous day-night affair, also buckled under pressure and was out for 13 off Nuwan Kulasekara, who got him caught by wicketkeeper Sangakkara in the ninth over. Rohit Sharma (15) then returned to pavilion in the 15th over. India's hopes suffered a further jolt when Muralitharan removed an in-form Yuvraj Singh. The offie caught the Punjab batsman, who adorned his 73-run knock with 11 boundaries and a six, off his own delivery. Dhoni took charge of the proceedings for almost next 10 overs before he was sent packing by Sanath Jayasuriya. For Sri Lanka, Dilshan (97) missed his century as Indian bowlers charged up only in the 42nd over to struck gold in the form of three crucial wickets. A blazing Sangakkara's stint was also cut short on 84. Fall of wickets: 1-66, 2-209, 3-255, 4-255, 5-256, 6-256, 7-277, 8-315. Bowling: I Pathan 9-0-55-1, Ishant 10-0-60-3, Balaji 5-0-32-0, Sehwag 3-0-26-0, Jadeja 6-0-40-0, Y Pathan 3-0-20-0, Raina 6-0-24-0, Yuvraj 6-0-39-2, Rohit 2-0-13-0. Fall of wickets: 1-8, 2-9, 3-52, 4-85, 5-121, 6-138, 7-193, 8-217, 9-243. “Our bowling was not strong. But it was good to have a go at the guys who had not played. (Ravinder) Jadeja got a chance see what international cricket is all about and how tough it can be sometimes,” Dhoni said after 68-run loss which prevented them from making a clean-sweep of the series. “Overall it was good, though we lost (today), we won the series,” he added. The Indian captain dedicated the series win to his teammates, who, he says back each other and enjoy each others success. “The overall team morale is good. It’s important to have good dressing room atmosphere and guys back each other and enjoy each other’s success. Whenever I needed them they were there, whether I needed a batsman or a bowler (to perform). So I dedicate this win to my teammates. 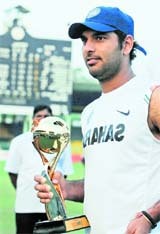 Hopefully, we will continue to win more tournaments,” Dhoni said. The Sri Lankan skipper Mahela Jayawardene praised his top-order bastmen for laying the platform for consolation win. “We had spoken to the guys. We were disappointed after four defeats. I think the wicket played a big role... Jayasuriya and Dilshan gave us a good platform to push for 300 and once we reached there we had advantage. The Sri Lankan skipper said his teammates were determined to win today in the view of their upcoming Pakistan Test tour. “Everyone realised and put heart and soul into it. We had not come here to lose but we were up against a very good side. We came back and won that showed the character and that is what is required of the guys. “Now we are looking forward to the Pakistan tour, hopefully we will do well there,” he said. Harender Singh said the final was going to be a different ball game altogether and he was depending on the boys to do well. The coach in-charge said he had full faith in the capabilities on his boys. “In the previous two games, they did not fare badly against Holland. I promise an exciting game tomorrow,” a confident Harender stated. In the first game against the European champions, after facing a one-goal deficit, a three-goal blitz by Shivender Singh, Prabhjot Singh and Tushar Khandekar within no time rattled Holland. Though the match ended in a 4-4 draw, the Indians proved that they could be tough customers. India again played a 2-2 draw in the second match against the European powerhouse. Quizzed whether experienced striker Deepak Thakur would take the field in the crucial match, Harender revealed that he would not like to rush him in the playing XI and would rather go by the advice of doctor, who had prescribed a week’s rest to him. “To me, Deepak is more important for the future,” he concluded. Australia, who were bolstered by the forced return of captain Ricky Ponting, rode on wicketkeeper Brad Haddin's maiden ton (109) to post 301 for nine, after New Zealand captain Daniel Vettori's inserted them in. They then bundled out the Kiwis for 269 in 47.3 overs to notch up their first win of the series and make the scoreline 2-1. The home team, though, had to survive some anxious moments with Grant Elliott (115) almost single-handedly threatening to win the match for New Zealand with a superb crunch-time maiden hundred only to fail near the finishing line. Chasing a target of 302 to seal the series, New Zealand started their reply disastrously and by the sixth over they were two down for 16. Fall of wickets: 1-135, 2-169, 3-187, 4-200, 5-212, 6-274, 7-297, 8-297, 9-299. Bowling: Kyle Mills 9-0-59-2, Tim Southee 10-0-52-0, Daniel Vettori 10-0-52-1, Iain O'Brien 10-1-68-3, Grant Elliott 8-0-44-2, Jeetan Patel 3-0-25-0. Fall of wickets: 1-12, 2-16, 3-96, 4-149, 5-152, 6-157, 7-183, 8-252, 9-262. The Sunday Telegraph described England's capitulation as ''spineless... utter disgrace and a shameful chapter of English cricketing history''. ''England collapse in chaos'' said a headline in the tabloid News of the World next to a photograph of England's humbled players, heads bowed, on the Sabina Park pitch. It described the performance as a ''day of shame'' for captain Andrew Strauss's team and the players as ''nothing more than a shambling bunch of amateurs''. The Sunday Times said desperate England had ''sunk to their knees'' and suggested that Australians worried about the dip in form of their team would once again be relishing the Ashes series against England later this year. Still 446 runs adrift of an unlikely win, the hosts had captain and first innings centurion S Badrinath (35) and wicketkeeper batsman Dinesh Karthik (27) at the crease when stumps were drawn for the day. South Zone’s chase went haywire after Vijay and Uthappa’s solid first-wicket stand of 165. The duo negotiated the bowlers, particularly the spinners, confidently but both perished while going for ambitious shots. Former Indian captain Rahul Dravid was dismissed for a duck when spinner Ramesh Powar’s skidding delivery knocked off his defences. Powar earlier separated the opening pair, when Vijay edged one to Parthiv Patel. Uthappa, meanwhile, perished after trying to hit Rajesh Pawar over long off, giving away a simple catch to Siddarth Trivedi at mid-off. Uthappa, who was dropped by Wasim Jaffer at first slip when on 17, made 94 off 98 balls with 12 boundaries and three mighty sixes. Fow: 1-35, 2-182, 3-196, 4-228, 5-274, 6-298, 7-383, 8-396. Bowling: Sreesanth 14-2-58-2, Uthappa 3-0-12-0, R Ashwin 30-4-121-2, S Jakati 17-0-67-1, M Suresh 17-1-93-2, S Badrinath 9-1-38-1, M Vijay 2-0-16-0.